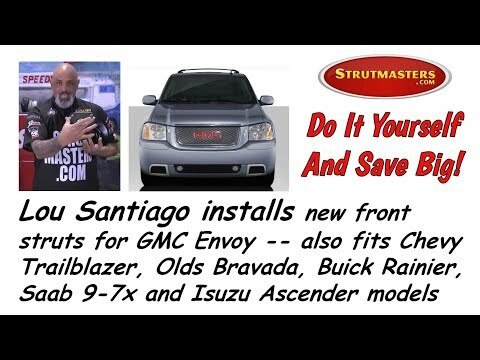 Strutmasters 2002-2009 GMC Envoy Rear Air To Coil Spring Conversion Kit is the perfect solution to your air suspension problems. Designed to be very affordable, you can convert your air suspension to use passive steel coil springs for less than the price of replacing Original Equipment air springs. For Standard Models Only; 7-Passenger Models Require Item Number GB1R02. 2002-2009 GMC Envoy Rear Air Suspension Conversion Kit (GB1R0) is the perfect solution to your air suspension problems. Designed to be very affordable, you can convert your air suspension to use standard. 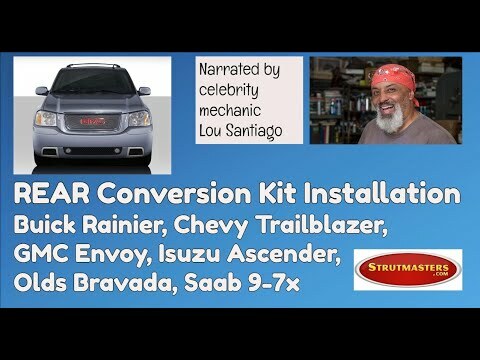 The assorted parts that make up the air suspension system on the 02-09 GMC Envoy must always function in sync. The entire system needs repair if only one part stops working. 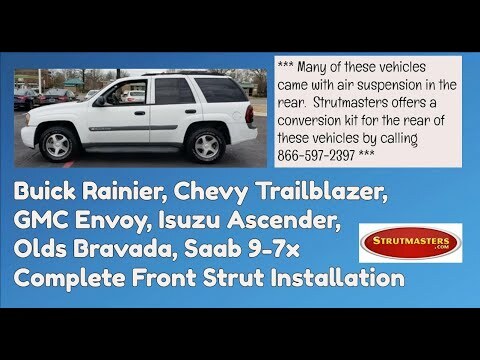 Strutmasters' unique air to non-air suspension conversion kit eliminates this dependency for good. This kit, made in the USA, includes two Eibach coil springs. The kit was designed to be an affordable direct replacement alternative to dealer repair- no modifications are required before it's installed! The parts are high quality and come with a Lifetime Limited Warranty. The kit is installed in as little as one hour per wheel, thanks to the accompanying detailed instruction manual. The suspension warning light typically turns off after about thirty minutes, too. If more help is needed, our certified technicians are available to answer your questions and concerns. Lastly, watch our installation videos that are available to view online. If the 02-09 GMC Envoy is not meeting and maintaining its proper ride height, a bad suspension may be to blame. Look for these signs of a failed or leaking air suspension before it‚Äôs too late and total failure sets in. The most noticeable is a sudden drop or squatting of three to five inches in the rear of the vehicle. A lean from one side to the other could be present. Other components may wear out, too. The air compressor, for example, may stop working or may run too often (in this case it is loud and noisy). Lastly, an illuminated suspension warning light on the dashboard is an obvious red flag for suspension trouble. If any of these symptoms are present, get the suspension fixed promptly. Choosing the rear air-suspension conversion kit for the 2002-2009 GMC Envoy saves YOU over $700! 2002-2009 GMC Envoy Air Springs (x2) - commonly referred to as air bags, a plastic and rubber bag that uses pressurized air as a cushion to support the weight of the vehicle. These rubber air springs are the number one cause of all air suspension leaks. Since all air springs all go bad at about the same rate, if one is leaking, the others will not be far behind. For a proper repair, all of them need to be replaced at the same time. 2002-2009 GMC Envoy Shock Absorbers (x2) - has metal tubing filled with gas-charged hydraulic fluid in order to reduce or dampen vibration and bounciness caused by travel on a rough surfaces. Some models dampening may be controlled by the suspension control module and can be very costly to replace. 2002-2009 GMC Envoy Height Sensors (x2) - a linkage located near each wheel of a vehicle with any electronic suspension that, either mechanically or electronically, constantly measures the height of the vehicle, and reports this information back to the control module so that the computer can identify if changes in height need to be adjusted accordingly. The ride height sensor is a moving part, and like all moving parts, they will eventually wear out. 2002-2009 GMC Envoy Air Lines- tubes that run from a compressor to the air which carry pressurized air to the air springs in order to adjust the height of the vehicle, respectively. 2002-2009 GMC Envoy Solenoids (x2) - usually L-shaped, these plastic components connect the electrical connection and lines of suspension components to the suspension control module on vehicles with active suspension. The solenoid regulates the air pressure for each air spring. Solenoids start to leak as they wear out causing the vehicle to sag or to lean. This will cause the ride height sensor to send a signal to activate the compressor in an attempt to inflate the air suspension and level out the vehicle. This excessive work load will eventually lead to total failure of the compressor. 2002-2009 GMC Envoy Compressor Assembly- creates/sends pressurized to active suspension components. When the air suspension starts leaking, the compressor/pump starts working harder to try to keep the system inflated. By the time air suspension leaks down completely, sitting the vehicle on its tires, the compressor will either have failed or be well on its way to full failure. Buying replacement air springs and taking the time to install them only to find out the compressor still needs to be replaced can be very frustrating, time-consuming, and expensive. 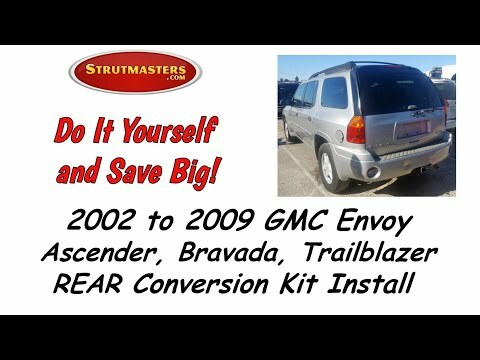 2002-2009 GMC Envoy Dryer- prevents moisture build-up inside of air suspension parts. 2002-2009 GMC Envoy Suspension Control Module- a computer which is responsible for the operations of the air suspension system and maintaining the vehicle's correct ride height. 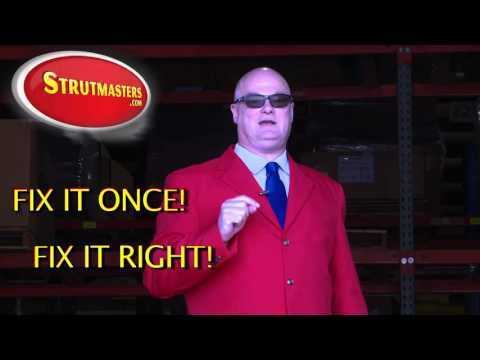 “Re: Air suspension replacement kit. Have to say I was skeptical at first. Usually I’m the type of person that wants factory parts. However, it’s clear many GM cars have the exact same air suspension deterioration issues, and the cost to fix is fairly large. My Strutmasters order shipped right away. It was 200 + an extra 100 for overnight shipping. My mechanic charged $200 to install the springs/shocks and disconnect the compressor. Overall, 500 isn’t bad and made me happy to order from Strutmasters. My 02 GMC Envoy is now in great shape with a rear end that doesn’t bottom out if left a day or two. The rear was a bit high at first but is already settling. Product seems great, the company reputable. My mechanic even vouched for them.